Are there different kinds of Merchant Accounts? How long do I have to wait for Approval? Why is AmCard Payments a better provider than my bank? I want to switch to AmCard Payments. Will I have to pay a fee to my old processor? What type of fees will I have to pay? What is your monthly minimum? What are statement fees? Do you support Gift Cards and Loyalty Programs? What are chargebacks and how do I handle them? What is batching and what does it have to do with my credit card processing? What is a gateway fee? What types of fees do you charge for individual transactions? Are the fees the same for both Retail and Internet transactions? What types of transactions can I process with AmCard Payments? What kind of equipment will I need to get started? Can I process transactions with a mobile phone? Will I be able to process Credit Cards over the Internet? What type of fraud protection does AmCard Payments offer? What is a CVV2 number and how does is protect my customers and me? A Merchant Account is the account or business relationship with Merchant Service Provider so your business can process credit cards and other types of non-cash payment. The Account is established quoted through an relatively simple application process. The goal of the Merchant should be to seek out the most cost effective Merchant Services Provider, while paying close attention to the value the Merchant Services Provider affords the Merchant. Are there different kinds of Merchant Accounts? -What is your application process? The most common kinds of Merchant Accounts are General Merchant, Retail, and E-Commerce. In addition, AmCard Payments specializes in High Risk Merchant Services for companies that may have had difficulty obtaining Merchant Processing in the past, or are participating in industries that are considered to have a higher level of carrying risk by Acquiring Banks, or Visa/Mastercard. A Full Service Merchant Services Provider has the ability to customize payment solutions to fit the needs of all types of Accounts. 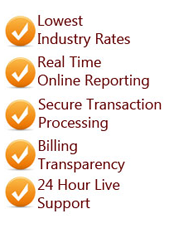 Applying for a Merchant Account has never been simpler. As a merchant, you will need to provide AmCard Payments with some fairly basic data about your business. While some other credit card processors require you to fill out lengthy forms and apply through the mail, we have made it easy to submit your application right here on our Website or over the phone with one of our Merchant Account Specialists. The process can be complete within 24 to 48 hours in most cases. The approval process varies in difficulty depending on customer service level of the Provider, and the type of Account required to fit the needs of the Merchant, along with the classification of risk, among other factors. AmCard Payments boasts “in-house” capabilities at every level of Customer Service, including our own Underwriting Staff, IT and Software Personnel, and proprietary processing, security, and gateway software. The vertically integrated structure of AmCard Payments contributes greatly to ease of the approval process for our client base. Our staff of full-time Underwriters is here to make sure that your application processing goes as quickly as possible. Depending on the size and scope of your business, you can be getting started with your new Merchant Account in a little as one day. Applying is quick with our easy online application and 24 hour Customer Service. As convenient as it may sound, there is a high cost to pay for that convenience in the form of increased transaction cost, AND decreased productivity and efficiencies. In almost all cases a reputable full service Merchant Services Provider can offer you far less expensive rates and far more features than your current financial institution can offer. In fact, your bank may already partner with AmCard Payments to offer some of the services we offer. AmCard Payments believes that reliable Merchant support is imperative. You can contact us 24 hours a day, 7 days a week through our toll-free phone number, or our Live Chat option on our website. All of our Merchant Specialists and Technical Support Experts are waiting on the line to support our customer base. Our Customer Service function is currently running at a 98.7% first call resolution rate. No. 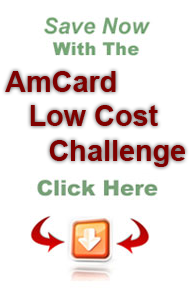 AmCard Payments goal is to reduce transaction costs, and all other types of fees and costs. If new customers were told a new partnership would mean additional costs, we would not be meeting our goals. There are many ways we can eliminate cancellation fees imposed by our competitors, including offering a credit equal to the amount of termination fees, if any. Just make sure you mention any fees to one of our Specialists when you are switching from another processor. Since these fees may be hidden, we strongly suggest and Account Review by one of our Specialists who can accurately define all costs associated with establishing a relationship with a new Provider. Only our experienced Underwriting staff can determine what your fees will be, as there are many factors that determine how competitively we can quote overall transaction costs. Beware of advertised rates online, and low “teaser” rates. Our goal is simple: To offer the most cost effective solutions to your business, and do so while offering the industry best in service. We consider success as a reduction in transaction costs while improving efficiencies for our customers. What is your monthly minimum? We ask that you process a minimum amount of transactions to your Merchant Account on a monthly basis. This amount depends on the industry type and other risk factors. For low volume transactions, we can offer a balance between costs and benefits for our customer base. Statement fees are simply the monthly fee we charge for servicing your Merchant Account and receiving paper statements in the mail. In an effort to encourage our customers to go green, we will reduce this charge if you decide to opt out of paper statements and use our advanced online features instead. Gift cards and Loyalty Programs are an easy and exciting way to market your business. As part of our vertically integrated approach, AmCard Payments can offer same day shipping on custom Gift Card and Loyalty Cards up to 100 pieces since the design and printing are done in house. For larger orders, we ask for a 3-5 day lead time so the cards can be mass produced on a slightly lower cost structure. Our in house consultants can help you develop and design a successful marketing tool using Gift Cards as new profit source. Ask one of our Merchant Specialists today how we can make your business grow through our variety of gift and loyalty programs and Gift Card Processing. If a customer disputes a charge or transaction, the credit card issuer sends the transaction back to us, the processor. We will then notify you of the problem. Chargebacks can happen for a variety of reasons both legitimate and fraudulent. When we inform you of the chargeback you have the choice to accept or dispute it. Our proprietary software has advanced security features to make sure that false chargebacks are kept to an absolute minimum. After a credit card is swiped and authorized at your point of sale, the transaction gets stored in the terminal as a batch. Batches are simply groups of transactions that have yet to be settled. It is advisable that you settle your batches in a timely fashion in order to qualify for the best interchange rate. If batches are settled within two days, a Merchant can insure they are conducting business in the most efficient way possible by avoiding any penalties and extra fees. Online businesses need a Payment Gateway in order to verify a customer’s data and determine the legitimacy of any given transaction. Usually, gateway providers charge a monthly fee that is billed to you through the AmCard Payments. Fees vary depending on the provider and whether or not the software chosen is proprietary to AmCard Payments. The very first “red flag” in the Merchant Services industry stems from the advertising and publishing of transaction fees and rates. A Merchant Services Provider cannot possibly advertise or publish “one size fits all” rates and costs, especially if they are a full service provider processing transactions across varying degrees of risk and industries. The publishing of these rates is simply a marketing tool to lure potential customers into the Sales Channel, who later learn that these rates do not apply to them for any number of reasons. The key consideration for Merchants is to select a Provider based on the combination of low costs and service, along with the promise of transparency in the relationship. Internet transactions generally come at a somewhat higher cost to Merchants based on the “Card-Not-Present” nature of these transactions, and the higher risk for fraud. Our goal is to insure internet transactions are verified in the safest and most efficient way possible thereby reducing overall transaction costs. Since AmCard Payments specializes in processing platforms considered by the industry as high (or higher than normal risk) risk, we are uniquely positioned to offer the most cost effective approach possible in our industry. AmCard Payments processes all major credit cards including VISA, MASTERCARD, AMERICAN EXPRESS, and DISCOVER among others. We can also provide Merchant Processing for Debit Cards, Check cards, and Gift Cards, as well as Paper Checks and Electronic checks. Our full service and vertically integrated approach is in place to insure our partners can attract every type of consumer to their point of sale. Equipment selection depends on how Merchants can maximize sales in the most efficient way possible. In many cases, AmCard Payments takes a “custom” approach based on the types of transactions a Merchant wants to accept, combined with multiple POS strategies (for instance combinations of card present and not present transactions). All systems utilize the most modern and industry accepted equipment available, combined with our full in house Technical Support Staff. Our approach is based on the belief that the Merchant needs come first, and AmCard Payments offers an array of different swipers, POS systems, and Virtual Terminals depending on what is required to maximize efficiencies. Absolutely. There are a few ways to do this. Ask one of our Merchant Specialists today to find out what will work best for your needs. There are many solutions available for online processing, all of which generally promise a secure site in which you can enter a customer’s Credit or Debit card information and complete your transaction. Our proprietary Software is equipped with advanced encryption solutions so your Merchant Account can be monitored to insure the most secure transaction possible. This dynamic software is monitored and updated daily by our in house IT Staff who’s mission it is to identify potential threats and adapt constantly to guarantee the highest level of security in the market today. AmCard Payments also offers advice, collateral, and educational tools directly to our customer base as part of our Fraud Protection Program. A CVV2, or Card Verification Value, is the three-digit number located on the back or front of a credit card. This number is not included with the information on the magnetic strip. Requiring your customers to enter their CVV2 number reduces the chance that of fraud because you can only see the number if you have the card in hand. Verifying this information can help reduce transaction costs.